Here at StashMyComics we want to devote a weekly segment looking back at the animated shows from the week before. So, in this week’s Cartoon Review we are taking a look at the most recent Young Justice episode Bloodlines. So sit back, relax, and take a look at what it was all about. 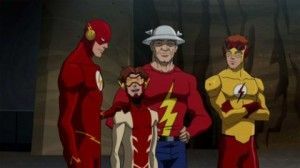 In this episode we’re introduced to Bart Allen, who travels back from the future to visit Barry. Meanwhile, Cheshire and Roy follow up on the intel Cheshire had received on the original Roy’s whereabouts. I have to start off by saying that this is my favorite episode so far this season and probably my favorite overall. Although I am incredibly biased because I absolutely adore Impulse. Roy and Cheshire head to Tibet in their search for original Roy. Cheshire tells Roy to stop referring to the original Roy as “the real Roy Harper” for the sake of their daughter. I like how Cheshire takes charge and refuses to let Roy wallow in his self-loathing. She tells him straight up that’s he’s not going to let this affect their family. Yeah, she’s going to be a great mom. After some sneaking and fighting with ninjas, Roy and Cheshire do indeed find the original Roy. He’s unconscious and missing half an arm, but we don’t know the full extent of his physical and mental state yet. I’m sure it’ll break my heart. Now, on to Bart’s storyline. Bart arrives in Mount Justice via time machine much to the surprise of Nightwing, Robin, and Beast Boy. After the three team members chase down and catch the recently dubbed Impulse, Bart informs them he’s from the future and is Barry Allen’s grandson. Nightwing needs proof, of course, and Bart gladly gives a DNA sample. But before Nightwing can run the test Bart escapes and heads for Central City. Now I’m already overwhelmed with emotion over Bart right now, but quickly everything turns into a Flash family reunion and I am losing it. Bart finds Barry and Iris celebrating Jay and Joan Garrick’s anniversary. Wally arrives shortly after (as called in by Nightwing). I had to take a moment to compose myself because I have no control over my emotions at this point. The reunion is cut short when a new villain called Neutron attacks the city. Flash races off to stop him. Bart races after to help. Wally dons his Kid Flash costume once again to help with the fight, and once again I have to take a moment to compose myself. Something I found weird is that Wally can’t keep up with Barry or Bart. Sure he’s out of practice, but he’s can’t even understand them when they’re talking super-fast (as in speedster fast). I hope there isn’t anything wrong with him. The Kroloteans lose control of Neutron and he becomes unstable and is going to explode. Barry plans to grab him and bring him to the desert, but Bart isn’t sure it’ll work. He goes to help and ends up saving Barry’s life by tripping into him. Barry wouldn’t have made it to the desert in time. Bart attempts to go back to his own time, but his time machine isn’t working. Looks like here’s here to stay and I’m so happy I could die. Flash-forward to 40 years in the future to the moment before Bart travels back in time. Everything is grey and it looks like ash is falling from the sky. He discusses the importance of the mission with future! Neutron. Why Bart and Neutron are working together is unclear. Bart travels back and Neutron’s prison uniform changes into normal clothes, but nothing else changes. How did everything change for the worse in just 40 years? We’ll have to stay tuned.